Dan Sherman spent nearly 3 years of his life as a member of the US Air Force working for the National Security Agency (NSA) as an electronic intelligence specialist. 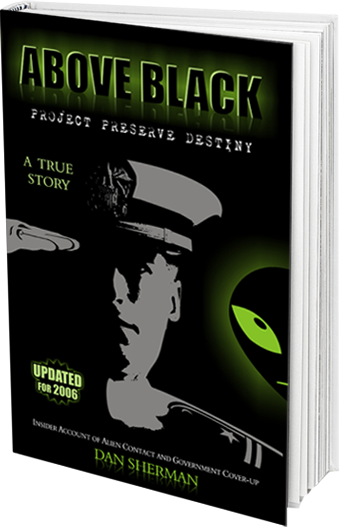 During that time, he was an integral part of a project called "Preserve Destiny"... a project deeply involved with alien contact. 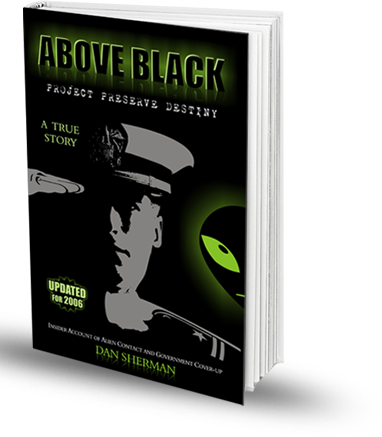 Since ABOVE BLACK was released, I have been interviewed on Sightings on the Air with Jeff Rense twice, Coast to Coast with Art Bell and have spoken in front of over 100,000 people regarding my experience. I've also been interviewed over 100 times for radio, TV and print and my book has been shipped to more than 45 countries. There's even been a musical CD written, the music of which was inspired after the musician read my book. Before passing me off as just another loon, read the extensive reviews interspersed below. 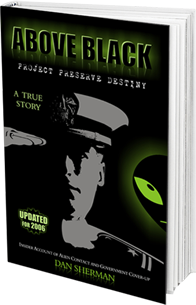 I'm told over and over again by readers of my book that they didn't really believe the US government was in contact with an alien race until they read ABOVE BLACK. I believe the reader can sense that I'm describing things, just as they happened. I have to address the obvious... why did I come forward with my story? Please know that I didn't do it to make money or be famous. I actually dread the notoriety since I have a business to run and this gets in the way, especially with credibility issues. No, my ultimate goal is to heighten public awareness about what is going on within our government and to get the word out that we are not alone in the universe. Of course, I'm not oblivious to the fact that my experience is something people want to read so, yes, I make money from the sale of the book. It's no different than an ex-president or someone else in government writing about their experience while in office and selling their story in book form. It supplements my income and helps me speak to groups about my experience when I have the time to do so. Please believe that I am by no means becoming wealthy from the sale of ABOVE BLACK. I loved the book-too often people look only at what is written on the surface-it is what isn't written in this text that is so fascinating- real experiences follow a path of logic that leaves memory in chunks-ie not like a fictional account-these are the kind of people that we can all learn from-not so concerned about looking good, just sharing the truth the best they know how-Thanks Dan. 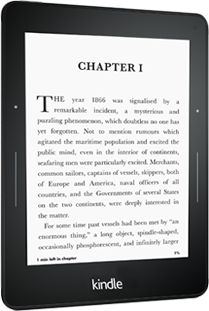 Above Black Is An Excellent Insiders Account! Above Black is captivating and interesting from the moment you pick it up, until the moment you put it down. SSGT Dan Sherman talks about his time as an IC (or intuitive communicator), in which he was taught to use a special ability that he was givin through "Genetic Management". This book is worth your time, and an excellent read. It really opens your eyes, and allows you to make sense of a lot of things. Regardless if you are a UFO skeptic or enthusiest, you need to read this book! For the interested, about three years ago I met with a retired AT&T marketing executive. His market segment was the US Intelligence Community. Upon learning this I inquired about Project Preserver Destiny - the subject of Sherman's book. He said yes had heard of the project at a classified briefing and he also understood that communication withs aliens were occurring somewhere in the American West. Assorted pictures related to the author's assignments and an interesting scan of his change of station orders. "I just hope the intensity of the event doesn't directly correlate with the intensity of the physical manifestation I've been experiencing. If it does, it will be absolutely devastating. Let's hope I'm wrong." There's much more regarding this impending event quoted in ABOVE BLACK.